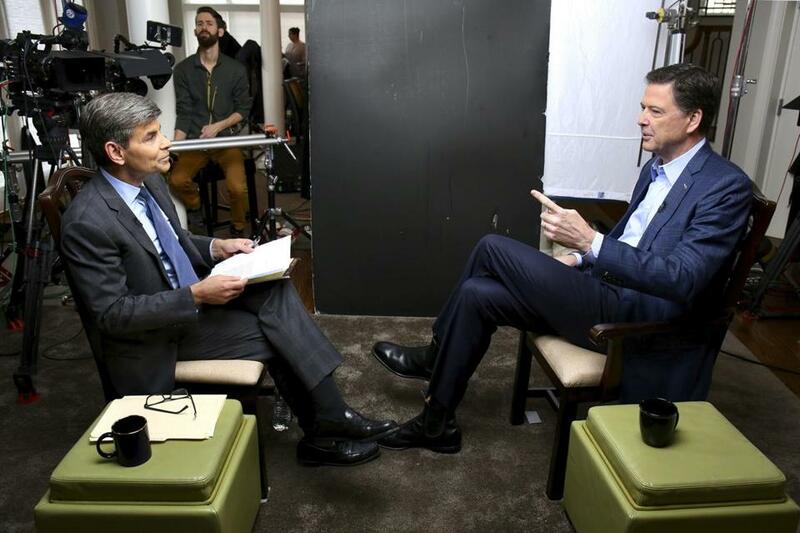 ABC’s George Stephanopoulos (left) interviewed former FBI director James Comey for a taped sit-down that aired Sunday. 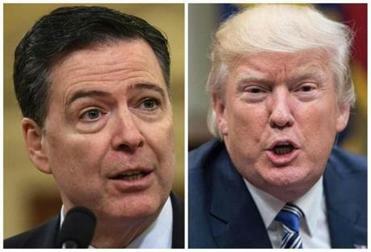 WASHINGTON — If there was any chance that President Trump and James Comey could have avoided all-out war, it ended Sunday night. That was when ABC News aired an interview with Comey, the president’s fired FBI director, as he uses a publicity blitz for his searing tell-all memoir, “A Higher Loyalty,” to raise the alarm about the dangers he says Trump poses to country. While ABC aired one hour of its conversation with Comey, it had conducted a five-hour interview with him, a transcript of which was obtained by The New York Times. In it, Comey called Trump a serial liar who treated women like “meat,” and described him as a “stain” on everyone who worked for him. He said a salacious allegation that Trump had cavorted with prostitutes in Moscow had left him vulnerable to blackmail by the Russian government. And he asserted that the president was incinerating the country’s crucial norms and traditions like a wildfire. He compared the president to a mafia boss. The interview with Comey and the publicity tour for his book, which is scheduled to hit bookstores Tuesday, amount to a remarkable public assault on a sitting president by someone who served at the highest levels in the government. The stakes for both men could hardly be higher. Comey seems likely to be the star witness in any obstruction of justice case that might be brought against the president by Robert Mueller, the special counsel in the sprawling Russia investigation. Trump’s legal fate, as well as his political fortunes in Washington, may depend on whether he succeeds in undermining the credibility of Comey and the law enforcement institutions he views as arrayed against him. While many of Trump’s critics believe that the proper remedy for his perceived transgressions is impeachment, Comey insisted that would just “let the American people off the hook.” He said the public was “duty bound” to vote Trump out of office in the next election. But Comey responded to the president’s Twitter posts with a more subtle dig of his own. It is unclear where this epic battle of wills will lead, other than a sustained escalation of insults between two men who have each admitted to having outsize egos. But it is certain to be a test of powerful forces in the modern media landscape: the presidential megaphone, amplified by 50 million Twitter followers, and the global reach of an adversary who is on a seemingly endless, 24-hour, cable-news-driven book tour. The president took a break from his attacks on Comey as he left the White House on a rainy Sunday afternoon to spend time at Trump National Golf Club in Sterling, Virginia. But it seemed likely that he and his allies would not back down in the face of Comey’s barrage of public accusations, which are expected to continue for weeks. Comey was similarly unrestrained in his ABC interview, speaking with the abandon of a man who finally feels unleashed. He repeated for the cameras some of the assertions from his book that he must know will get under the president’s skin: that Trump’s hands are “average-size,” that his skin is “orange” and that he seemed shorter than Comey had imagined he would be. Some of the most startling assertions by Comey revolved around his first meeting with the president-elect at Trump Tower just days before the inauguration. That day, intelligence officials, including Comey, briefed the incoming president on Russia’s attempt to meddle with the election. Comey said Trump and his aides seemed interested only in what the former FBI director called the “PR and spin” about the issue. “It was all, ‘What can we say about what they did and how it affects the election that we just had?’” Comey said. It was at the end of the meeting that Comey said he asked to speak to Trump alone to brief him on the salacious “Steele dossier,” which contains unverified allegations about Trump, including a claim that the Russian government has video recordings of him watching prostitutes urinate on one another in a Moscow hotel room in 2013. Comey said Trump denied the allegations that day, saying, “Do I look like a guy who needs hookers?” Weeks later, in a telephone call after the dossier was published by BuzzFeed, Trump again denied the account in graphic terms, Comey said. “There’s no way I’d let people pee on each other around me,” Trump said, according to Comey’s account. Comey said the president also raised the idea that the FBI should investigate the claim as a way of proving that it never happened. Comey said he warned Trump that doing so would add to “the narrative” that the president was under investigation. Comey said in the interview that he did not know whether the episode had taken place, or whether the Russians had material they could use to blackmail Trump. Comey also offered additional details about the one-on-one dinner at which he says Trump demanded his loyalty. That dinner felt like a mob initiation of sorts, Comey said in the interview, similar to the ones he often came across as a young prosecutor working to break up the mafia. As he does in his book, Comey largely kept a distance in the interview from the Russia investigation. But he said Trump must have known that it was improper to ask his other top aides to leave the Oval Office so he could privately ask Comey to drop the investigation into Michael Flynn, his just-fired national security adviser. “If he didn’t know he was doing something improper, why did he kick out the attorney general and the vice president of the United States and the leaders of the intelligence community?” Comey said. The president has repeatedly criticized Comey for his handling of the Hillary Clinton e-mail case. On Sunday, he did so again in a Twitter post, claiming that Comey had admitted in his book that he went easy on her because he thought she would win the election. In fact, Comey said the opposite in his book, acknowledging that he may have unconsciously assumed she would win when he reopened the e-mail investigation just days before the election, something that many Democrats believe was devastating to her campaign. In the ABC interview, Comey said he believed at the time that it would be extremely damaging to the credibility of the FBI if the reopened investigation did not come to light until after Clinton had won the White House.